Oh yeah? You and Honami? 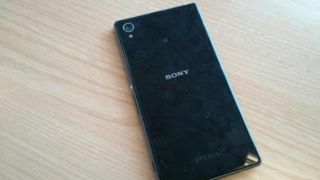 Sony's new boss level smartphone? Sony's heavily-rumoured new flagship mobile device, believed to be codenamed Honami, has reportedly made another public appearance in an array of leaked snapshots. The device, which could arrive named the Xperia 1i, has been tipped as a 20-megapixel smartphone to sit alongside the larger, recently launched Sony Xperia Z Ultra phablet. If these new snaps prove to be credible, the Honami (or 1i, or whatever) will arrive looking an awful lot like the current iteration, with a few notable exceptions. Indeed, the snaps showcase an extremely slim device, with clearly defined square edges and that signature, premium Sony design language. However, it does look as though Sony is throwing a glass backplate into the mix this time around. Meanwhile the bottom of the device sports an exposed speaker perforations, meaning it's less unlikely to arrive with the same waterproof and dustproof certifications as the Xperia Z. The latest pics of the device, which came via the Gadget Helpline website, seem to back up what previous leaks have already suggested: Despite the likelihood of a very large sensor size, Homani won't pack a protruding camera module, a la the Nokia Lumia 1020. Previous leaks have suggested there'll be a 2.2GHz quad-core Snapdragon 800 chip, Qualcomm Adreno 330 graphics, 2GB of memory, 16GB of storage, microSD, LTE and NFC support. It almost goes without saying that the purported a 5-inch display will be full HD, while a 2-megapixel front camera, and a 3,000 mAh battery may sound out the spec sheet. Could the Sony Xperia 1i by the next camera phone king? With these rumoured specs, it'd take some beating.